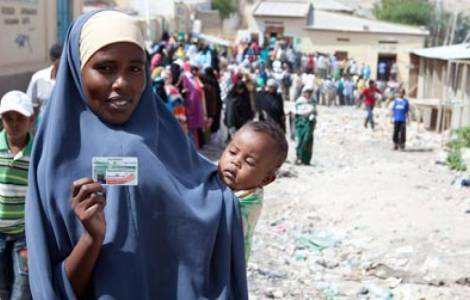 AFRICA/SOMALIA - Elections in Somaliland, Mgr. Bertin: "Democracy is possible in the Horn of Africa"
Djibouti (Agenzia Fides) – The vote in Somalia gives hope and represents an encouraging form of democracy: the November 13 elections, to choose the president who will succeed Ahmed Mohamed Silanyo, took place regularly and it will take a few days to make the results official. "These elections are important – says Mgr. Giorgio Bertin, Bishop of Djibouti and apostolic administrator in Mogadishu to Agenzia Fides - because they can continue to demonstrate that some form of democracy is possible in Somaliland and, if all goes well, they will represent a further demonstration of the institutions seriousness. For Somaliland – he continues - this appointment means that the country remains stable; for Somalia and for the whole region it represents the demonstration that a certain form of democracy is also possible in the Horn of Africa because there are difficulties with regards to democracy in Ethiopia, Kenya and Djibouti; and this small unrecognized state could encourage the people in nearby countries to choose paths towards full democratization". Somaliland, former British protectorate, declared independence in 1991 but, to date, it is not recognized by any state of the international community. Over the years, mixing traditional and modern elements, political leadership has managed to pursue a democratization process that has guaranteed some stability. Despite corruption and clanic influence (deaden but not uprooted in the political system) Somaliland is today organized as a real and proper state: it has a Constitution, approved by popular referendum in 2001, a multiparty system, holds elections and has of an army, a flag and own currency. The November 13th election date took place after a two-year delay compared to the presidential date: partly because of the great difficulties suffered by famine and droughts that hit the entire Horn of Africa, partly because of the registration process of the voting people. Out of a largely nomadic population of 4 million people, about 700,000 registered to elect the new president. In addition, Somaliland used a iris-based biometric system. Over 1,600 seats were organized in schools and universities of different provinces. The vote was monitored by a Commission consisting of 60 international observers from 24 countries. There are three candidates running for the presidential office: Muse Bihi Abdi, the candidate of Kulmiye, the party of outgoing president (Solidarity party); Abddirahman Mohamed Abdullani 'Irro' of Waddani (National party); the third candidate is Faysal ali Warabe of Ucid (Justice and welfare party). The electoral campaign of the three aspiring presidents took place without any tensions being registered: each of the candidates was given specific days to submit their own program, and the three then confronted each other in a public debate, followed by the media and broadcast via streaming from the capital Hargeisa. The National Election Commission blocked social media starting from the closing of the seats until the results are made official. The measure was justified with the intention of preventing the circulation of "fake news" especially in relation to false results.